Señor Raúl Moroni of Santiago de Chile has drawn our attention to railways used in the building of or the supply to lighthouses down the Chilean coast. From about 1890 onwards the Chilean government began to explore the possibility of constructing lights to protect the many ships using Cape Horn or the Straits of Magellan before the building of the Panama Canal. The most famous of these is on Islote Evangelistas at the extreme western end of the straits. A Chilean navy report on the history of Chilean lighthouses (1) mentions "un aparejo mecánico para el desembarco de cargo, así como un sistema de tracción para trasladar los materiales hasta la cima del islote." A recent publication on these lights shows this to have been a railway track, probably of 60cm gauge and perhaps 100m long (1A). 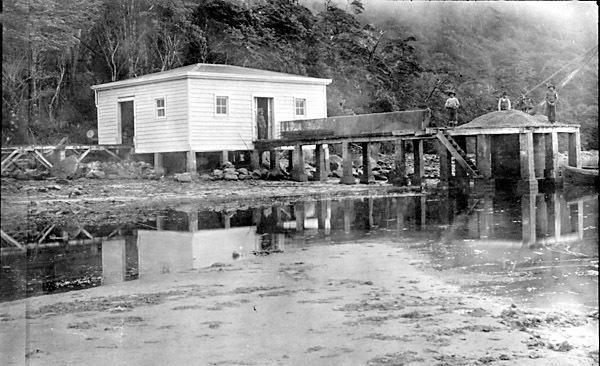 The Faro Bahía Felix (Felix Bay lighthouse) which was completed in 1907, also had rails up from its muelle, with a hand winch. This worked until its replacement by a road and electric winch during 1996-7. The same recent source mentioned above has an unclear photo which seems to show a short but relatively broad inclined railway track. 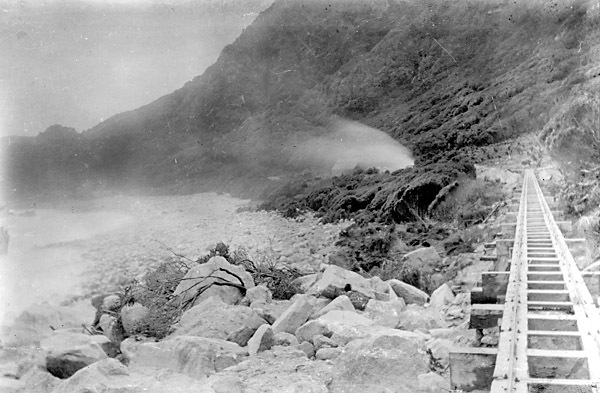 Further north, the most interesting of lighthouse railways was at Cabo Raper out at the end of the Taitao Peninsula. The location was 150ft up at the top of an exposed cliff. The landing of materials in such a location would have been impossible and the presiding engineer, George Slight from Scotland, resolved to gain access from the rear (2). By entering the Seño Hoppner and sailing south-west up a narrow sea loch for 15 miles it was possible for small vessels to reach a beach only 4 miles from the lighthouse site. This location became Puerto Slight and a muelle and base camp were eventually built here. The extract below is from the British Admiralty chart no. 1287 of 1964. The lighthouse can be clearly seen, as can the access route from the Seño Hoppner to the north east. Contour lines of 1000 and 2000ft can be made out on the ridge but it seems from later Chilean charts that the isthmus was rather more manageable if a south-westerly route was chosen to reach the Pacific coast across the narrowest point. A satellite view from Google Earth shows the same area to a larger scale and with the topography showing up clearly. 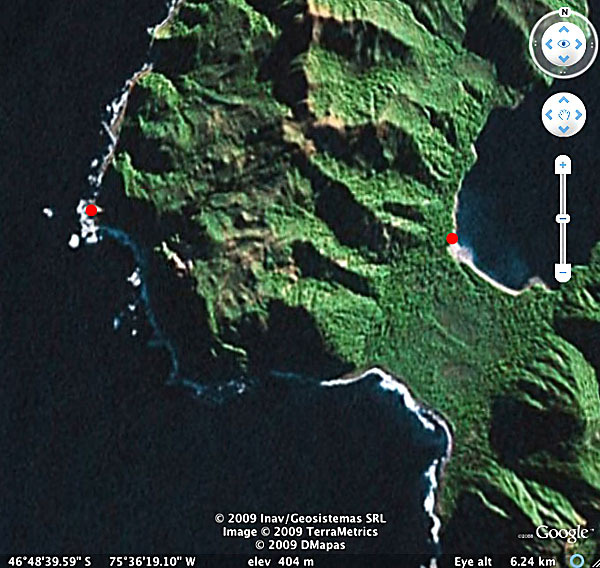 Puerto Slight and the lighthouse location have been marked with red dots, and it can readily been seen that the most practicable access route between the two lies across the isthmus and around the coast. The photo below, taken from a Chilean Navy helicopter, shows the rugged fjord landscape and the relatively easy crossing of the isthmus. 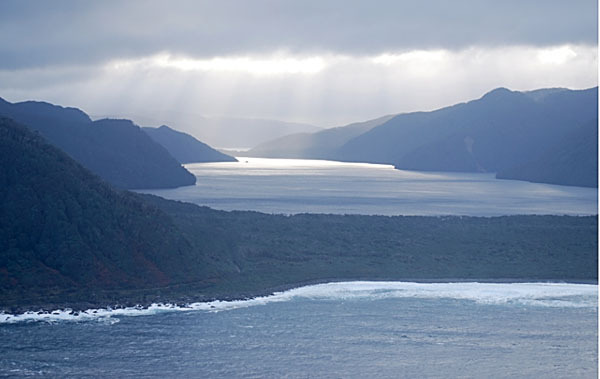 (5) The Estero Slight is in the background, with the Pacific Ocean in the foreground. Having crossed the isthmus, the railway builders had to pick a route along the Pacific shore (5). As can be seen from this modern aerial view, the lighthouse site was not only out on a headland but also at a height above the shoreline access route from the right background (5). To give a sense of scale, the top of the big landslide scar on the hill in the background is about 1km. from the lighthouse. The route across the isthmus to the lighthouse was fairly rugged and the actual construction site was out on a narrow headland. 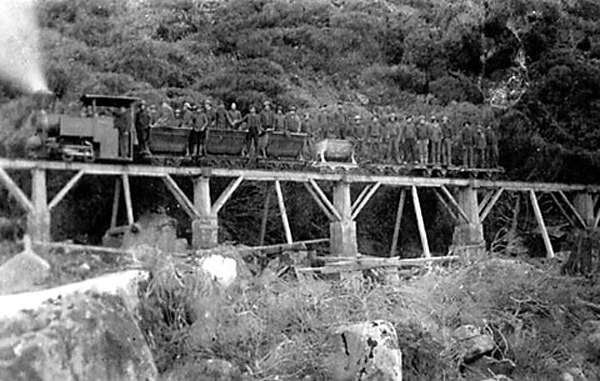 In the circumstances what was needed was not just a railway but one to climb steep gradients. This caused us some confusion during the research for this page, for one source mentioned that the railway was 'con cremallera'. This commonly means a rack railway but as in this case it can also refer to a winch-operated incline. 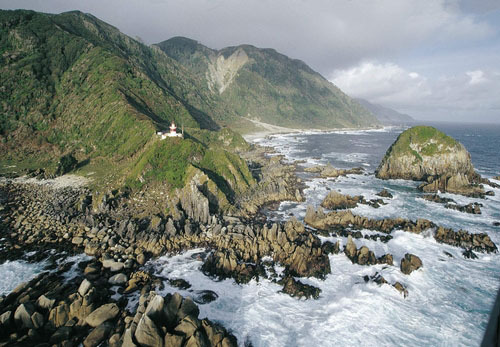 The route was planned to cross the isthmus at its lowest and narrowest point before following the Pacific coast and finally climbing up a rope-worked incline to the lighthouse site out on the narrow promontery. In reality the isolated nature of the site caused serious problems with the workforce and work ceased until other projects were completed. This photo of George Slight, the engineer of the Cabo Raper light and its construction railway, was kindly provided by his grandson, Sñr. George Slight of Santiago. In 1910 work restarted. A camp and muelle were erected at Puerto Slight. 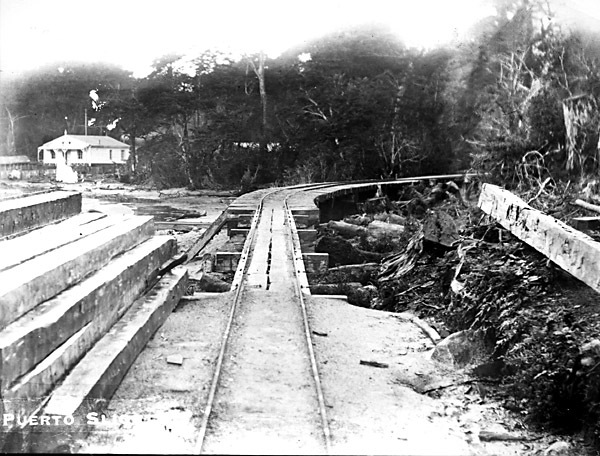 A narrow-gauge railway of 60cm gauge or thereabouts was built over the isthmus involving some spectacular viaducts with piers of the relatively new concrete. 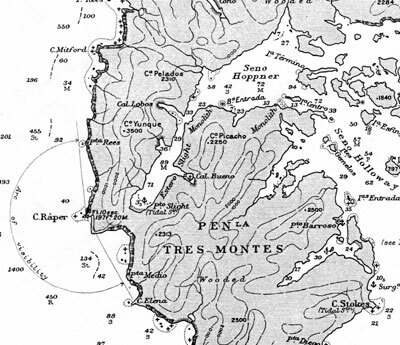 The route hugged the Pacific shore very closely after crossing the isthnus and the final climb to the construction site was by means of a steep incline and a winch. The lighthouse eventually came into operation in 1914. The naval report cited earlier (1) suggests that the railway had used one locomotive which continued in occasional use for ferrying supplies until about 1921. The loco having been damaged, wagons continued to be used but 'pulled and pushed by hand' which must have been quite a task. It seems likely that the railway track fell out of use about 1933, and that a tractor is now used to take supplies to the lighthouse. A second-hand 1980s report suggests that the loco still lies at Puerto Slight abandoned on the old railway track. A Chilean naval representative lives at Puerto Slight, one of the most isolated postings imaginable. Allen Morrison of New York has forwarded a number of photos from his collection showing this most isolated railway. This first one shows the muelle at Puerto Slight and the terminal building which may well have been used to keep cement dry in the very wet climate. The railway track goes off to the left on a low viaduct. The single track viewed from the Puerto Slight terminus. Whilst the easiest route over the isthmus was taken, it still incolved some substantial civil engineering through rock. Once over the col, the line headed west along the shoreline. This is a typical viaduct, with concrete piers and wooden beams. The planks suggest that it was also a walking route. A view further on. 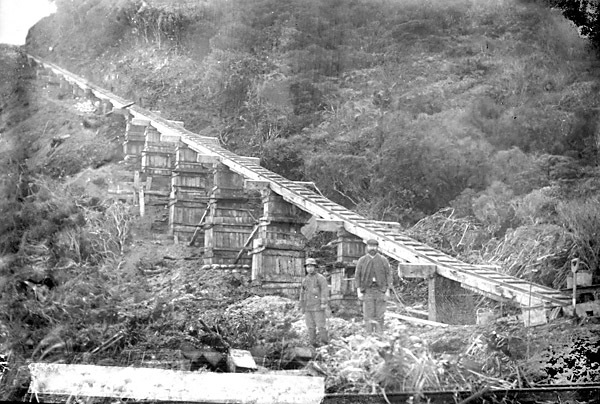 Possibly there was a parallel walking route or, more likely the photo was taken before the viaduct had been finished. 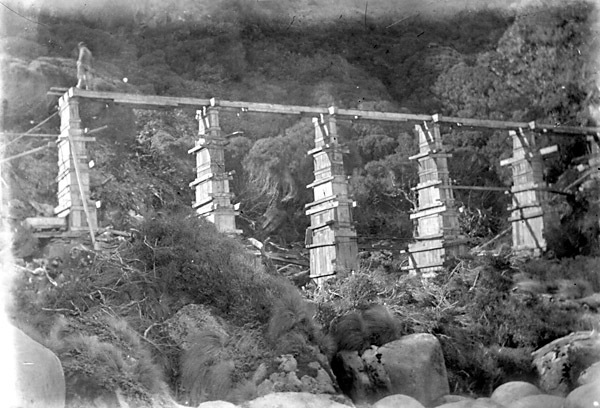 This photo shown one of the trestles under construction, with the piers still encased in their formwork. 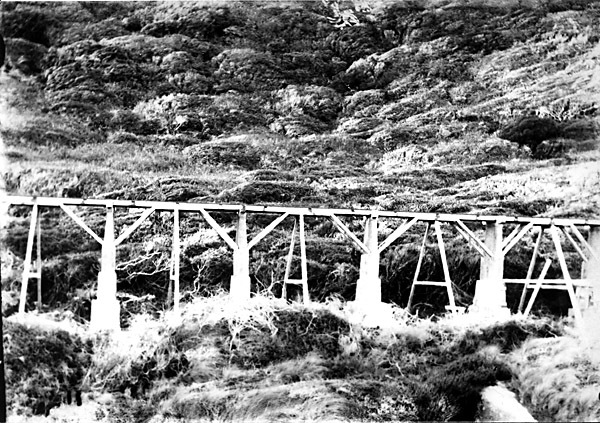 It is difficult to know whether the A frames at the centre of each span were part of the original design, a later addition, or maybe just temporary features of the construction period. Personally, I would not have been keen to take a steam loco along the line without them! 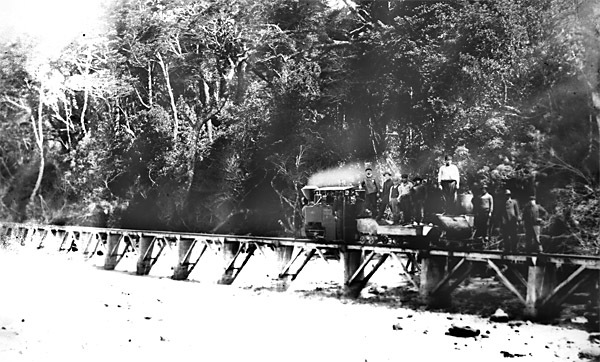 A train is shown below, at Puerto Slight, followed by an enlargement of the loco itself. One of the bridges is illustrated, with piers in concrete. The loco appears to be a Koppel or O&K 0-4-0T judging by its Germanic style boiler fittings and Koppel style valve gear, but has obviously been built or converted for a very restricted loading gauge. It seems likely that the loco is O&K no. 4975 of 1912 which was delivered to the Dirección del Territorio Maritimo at Punta Arenas. Whilst the spark-arresting chimney may indicate that the loco was to burn wood, no reason for the unusually low footplate and cab has yet been discovered, unless it was merely to minimise the danger of being blown over during Pacific gales! 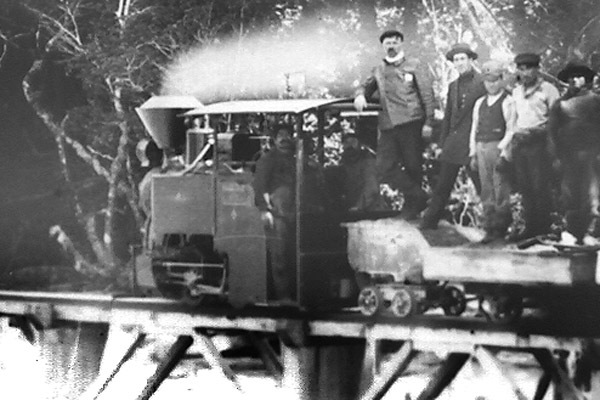 The loco is also shown clearly in this side view of a train on one of the trestle viaduct sections. The wagons seem to be all four-wheelers, with skips of two distinct designs and some flats visible. 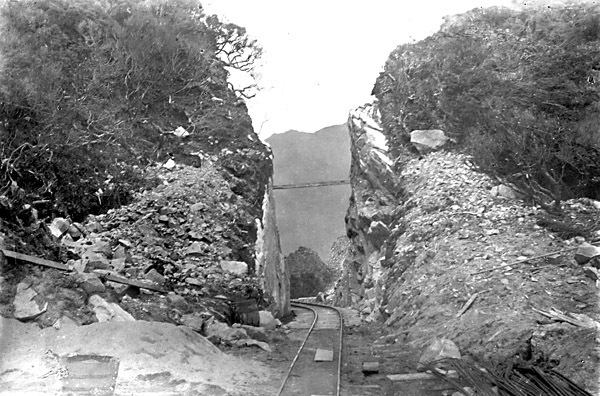 The final climb to the light was by means of the incline, shown below under construction. There seems to be a track in the foreground too. 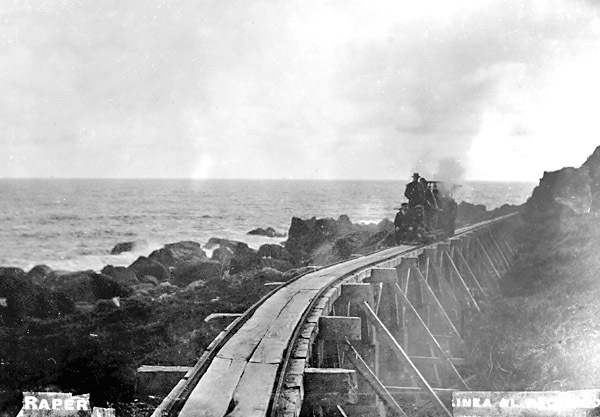 This must have been a most spectacular railway, with its viaducts almost overwhelmed by the surf of the Pacific and its final incline up to the light. The photo below shows the lighthouse roughly as it is today. 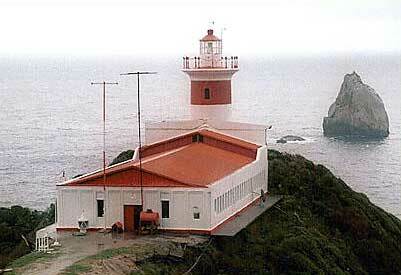 This picture has been borrowed from a website on the lighthouses of Chile. A series of recent photos can be accessed on the next page. A lighthouse was constructed on this headland about 50 miles north of Puerto Deseado in Santa Cruz province, between 1915 and 1918. The inductrial archaeology of this area has been comprehensively covered in its own website at <http://farocaboblanco.com/index.php>. It is reported there that a decauville type line of 650m brought materials approximately 650m from the point of disembarkation, which was presumably at the salt mine railway terminus in the bay south of the headland. An 'alambre-carril', a form of ropeway powered by a 'burro', was used for the final 80m to the site of the light (). 1 Faros Históricos Chilenos, by Carmen Hevia Jürgensen and Iván Vargas Marín; webpage available at <www.revistamarina.cl/revistas/1998/5/reportaj.pdf>. 1A Faros del Estrecho. Date unknown. M. Martinic. Publisher unknown. 2 Estrecho a todas luces, an article about the history of Chile's lighthouses by Señora Carmen Slight, in Revista del Domingo, the Sunday supplement of the El Mercurio daily. 14 December 1997. 3 All historical photos on this page are from the collection of Allen Morrison of New York. However, the original negatives and the copyright are held by Señor George Slight of Santiago, the grandson of Engineer George Slight, and we are grateful for permission to use these copies. 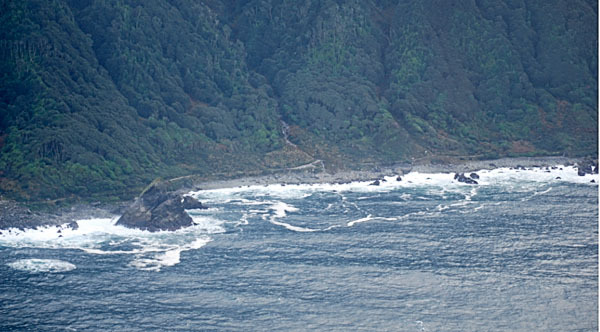 4 The Gold Diggings of Cape Horn. 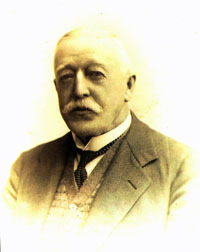 1895. J. R. Spears. G. P. Puttnam’s Sons, New York and London. 5 The modern photos were taken by personnel of the Chilean Navy (Armada de Chile).